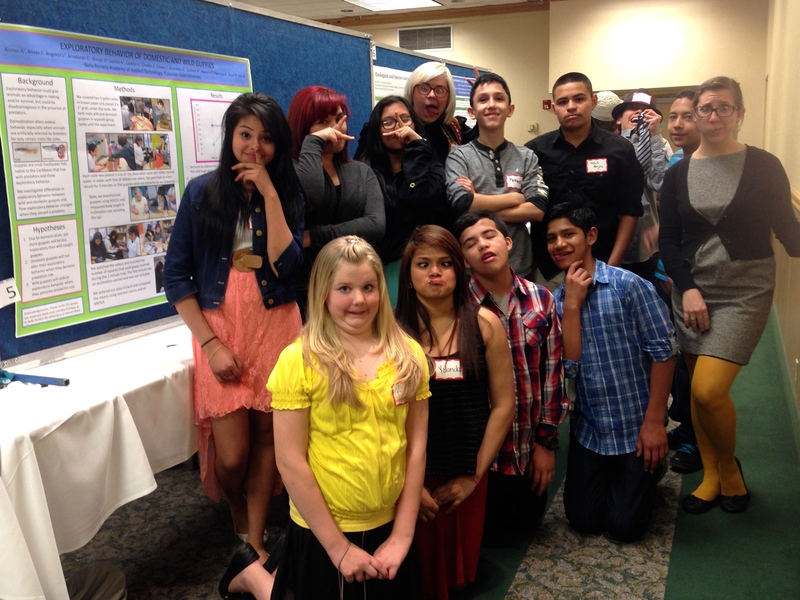 From 2014 through the present, I have worked with Katie Guilbert and some amazing groups of 8th graders from Bella Romero (Greeley, CO) to conduct research projects during an after school program. Bella Romero students introduce a domestic guppy into the test aquarium and press record on the iPad. We have a great team this year (2017-2018), and it’s made up almost exclusively by girls! We are investigating differences in cognition between domestic and wild guppies and between males and females. The cognitive task is to see if guppies can learn to fear a toy zombie through associative learning. I can’t wait to see what we find! Here are some updates of the team designing our experiment and collecting data. The Science Club ladies were amazing at FRSES this year. Our poster was beautiful and all of the graduate students and professors at the conference were talking about how cool the project was!